Oxfordshire B2Bs and B2Cs: What Does ‘Audience Engagement’ Mean to You? If you own or run a small-medium-sized business here in lovely Oxfordshire, (as we do), then we’re keen to know what the term ‘audience engagement’ means for you and your business . . .
‘Audience Engagement’> might sound like the latest marketing buzzword but in the context of an inbound content marketing strategy, its premise makes perfect sense. Rewind a decade or so and marketing agencies were firmly focused on outbound marketing strategies: direct mail, cold calling, magazine and newspaper ads. The idea being to get your latest promotion in front of as many ‘eyeballs’ as possible and exploit the ‘numbers game’ to your advantage. Yes it was targeted marketing to the extent that companies would buy in lists of likely prospects and promote their products or services to these audiences en masse. And of course, this still happens now – only these days ‘outbound’ is part of a wider marketing strategy. You see, the digital revolution has changed the face of marketing entirely. Old-school, ‘one-size-fits-all’ marketing no longer cuts it with today’s sophisticated online consumers. Buyers have much more choice than ever before as to who to give their custom to. As a smart business owner, your marketing needs to become customer-centric, rather than marketer-centric. Your marketing needs to have ‘audience engagement’ built into its DNA. In 2016, engaging your audience is the key to being super successful online – and offline too. The good news for business owners is that doing business online today is much more of a level playing field as regards your competition. Employing intelligent audience engagement strategies could not only see you outrank your ‘larger’ competitors in Google’s search results, but the number of leads and sales conversions you subsequently attract will speak volumes. Depending on your audience’s demographic, there are a number of proven audience engagement strategies you could utilise in your business. Check out our blog post: “16 Audience Engagement Strategies for 2016” for some great strategies you can implement right away. Again, the tools you employ to engage with your audience will largely be dictated by your target audience itself. Where does my audience hangout online? How does my audience prefer to interact? Which other non-competing sites/ influencers have the same audience I want to attract? Once you have your buyer personas in place you can work out a cohesive strategy for connecting with the people that matter most to you. One of the best tools we know of to help you build your buyer personas can be found at https://yougov.co.uk/find-solutions/profiles/ – here’s an overview of how ‘Profiles’ can boost your buyer persona ‘intelligence’ in 10 minutes or less. Remember, it’s simply a question of matching the most suitable communication channels with your buying persona(s). For example, if you are engaging with the 50-65 age group, you are unlikely to select Snapchat as your preferred means of communication as 71% of its users are under 34 years old. Okay, so that’s a fairly extreme example, but you’d be amazed at just how many business owners ‘throw marketing content into the mix’ and see what sticks! Following on from user-generated content, we predict that interactive marketing is going to be huge in 2016. Sometimes called retargeting or behavioural remarketing, if you’ve ever visited a site and found yourself ‘stalked’ around cyberspace by their ad as you browse other sites, you’ll know exactly what we’re talking about. But interactive marketing is not just for the likes of Amazon and co – if you want to step up the conversation with people who have visited your site but not taken action, then interactive marketing is a solution that might suit your business perfectly. Whether it’s streaming live videos via Periscope or Meerkat or interacting live on Blab, video and visual content will be must-have audience engagement devices in 2016. You can experiment with visual content such as infographics, memes and GIFs to discover what your audience responds to. Incidentally, when it comes to posting on social media, attention-grabbing visuals can make a huge difference to the shareability of your posts. Finally, both videos and other forms of visual content are more likely to evoke an emotional response in your visitors than plain dry text – and we know for certain that emotion plays a significant role in the audience engagement process. So what does audience engagement mean to you right now? 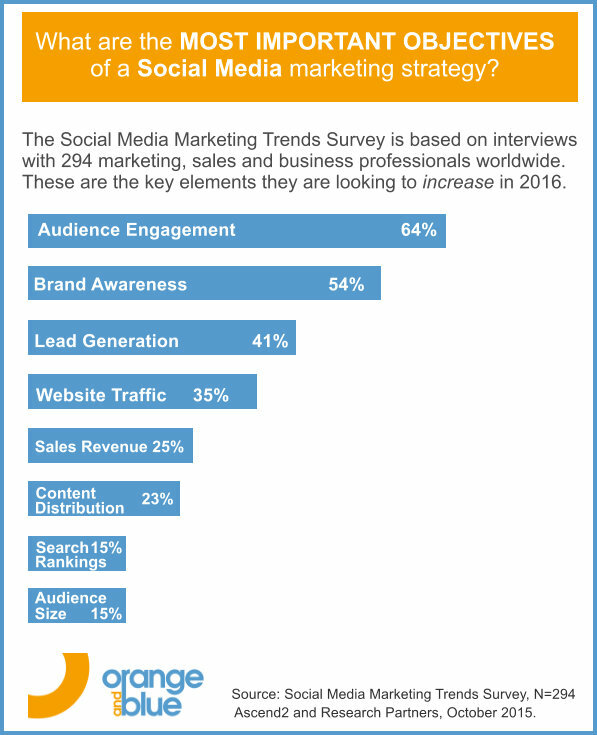 Do you, like 64% of businesses surveyed, plan to put audience engagement at the heart of your social media marketing strategy in 2016? In which case, does your website or blog further your aims? Or is it holding you back? Our FREE consultation will identify weaknesses in your current marketing and provide clarity about what needs to happen and when, in order for you to reach your targets. Call us today on 01865 590515, or email us at: [email protected] and one of our friendly team will be in touch directly. Over 10 years, Jan Jordyn's career path has evolved from outbound direct marketing copywriter to inbound content specialist, (HubSpot inbound-certified). As Orange and Blue's Content Manager, Jan is keen to help more clients reap the rewards of putting audience engagement at the heart of their marketing strategies.